A unique rapid-fire electron source—originally built as a prototype for driving next-generation X-ray lasers—will help scientists at the Department of Energy’s Lawrence Berkeley National Laboratory (Berkeley Lab) study ultrafast chemical processes and changes in materials at the atomic scale. This could provide new insight in how to make materials with custom, controllable properties and improve the efficiency and output of chemical reactions. This newly launched setup, dubbed HiRES (for High Repetition-rate Electron Scattering apparatus), will function like an ultrafast electron camera, potentially producing images that can pinpoint defects and their effects, track electronic and superconducting properties in exotic materials, and detail chemical reactions in gases, liquids and biological samples that are difficult to study using more conventional, X-ray-based experiments. The new research tool produces highly focused electron bunches, each containing up to 1 million electrons. The electrons stream at a rate of up to 1 million bunches per second, or 1 trillion electrons per second. Electrons will be used as a fast camera shutter to capture snapshots of samples as they change over femtoseconds, or quadrillionths of a second. An initial laser pulse will trigger a reaction in the sample that is followed an instant later by an electron pulse to produce an image of that reaction. HiRES delivered its first electron beam March 28 and experiments are set to begin in May. Daniele Filippetto, a Berkeley Lab scientist who is leading HiRES, has for much of his scientific career focused on building electron sources, also called “electron guns,” that can drive advanced X-ray lasers known as “free-electron lasers.” These electron guns are designed to produce a chain of high-energy electron pulses that are accelerated and then forced by powerful magnetic fields to give up some of their energy in the form of X-ray light. Free-electron lasers have opened new frontiers in studying materials and chemistry at the nanoscale and beyond, and Filippetto said he hopes to pave new ground with HiRES, too, using a technique known as “ultrafast electron diffraction,” or UED, that is similar to X-ray diffraction. In these techniques, a beam of X-rays or electrons hits a sample, and the scattering of X-rays or electrons is collected on a detector. This pattern, known as a diffraction pattern, provides structural information about the sample. X-rays and electrons interact differently: electrons scatter from a sample’s electrons and the atoms’ nuclei, for example, while X-rays scatter only from the electrons. The unique electron gun that Filippetto and his team are using is a part of Berkeley Lab’s APEX (Advanced Photo-injector EXperiment), which has served as a prototype system for LCLS-II, a next-generation X-ray laser project underway at SLAC National Acceleratory Laboratory in Menlo Park, Calif. Berkeley Lab is a member of the LCLS-II project collaboration. Filippetto in 2014 received a five-year DOE Early Career Research Program award that is supporting his work on HiRES. The work is also supported by the Berkeley Lab Laboratory Directed Research and Development Program. 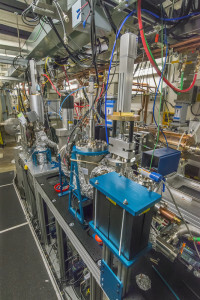 Already, Berkeley Lab has world-class research capabilities in other electron-beam microscopic imaging techniques, in building nanostructures, and in a range of X-ray experimental techniques, Filippetto noted. All of these capabilities are accessible to the world’s scientists via the lab’s Molecular Foundry and Advanced Light Source (ALS). Filippetto has a goal to improve the focus of the HiRES electron beam from microns, or millionths of a meter in diameter, to the nanometer scale (billionths of a meter), and to also improve the timing from hundredths of femtoseconds to tens of femtoseconds to boost the quality of the images it produces and also to study even faster processes at the atomic scale. Andrew Minor, director of the Molecular Foundry’s National Center for Electron Microscopy said he is excited about the potential for HiRES to ultimately study the structure of single molecules and to explore the propagation of microscopic defects in materials at the speed of sound. “We want to study nanoscale processes such as the structural changes in a material as a crack moves through it at the speed of sound,” he said. Also, the timing of HiRES may allow scientists to study real-time chemical reactions in an operating battery, he added. “What is really interesting to me is that you can potentially focus the beam down to a small size, and then you would really have a system that competes with X-ray free-electron lasers,” Minor said, which opens up the possibility of electron imaging of single biological particles. There are tradeoffs in using X-rays vs. electrons to study ultrafast processes at ultrasmall scales, he noted, though “even if the capabilities are similar, it’s worth pursuing” because of the smaller size and lesser cost of machines like APEX and HiRES compared to X-ray free-electron lasers. Scientists from Berkeley Lab’s Materials Sciences Division and from UC Berkeley will conduct the first set of experiments using HiRES, Filippetto said, including studies of the structural and electronic properties of single-layer and multilayer graphene, as well as other materials with semiconductor and superconductor properties. There are also some clear uses for HiRES in chemistry and biology experiments, Filippetto noted. “The idea is to push things to see ever-more-complicated structures and to open the doors to all of the possible applications,” he said. 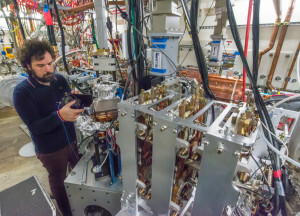 There are plans to forge connections between HiRES and other lab facilities, like the ALS, where HiRES is located, and the lab’s National Center for Electron Microscopy at the Molecular Foundry. Filippetto said there are discussions with ALS scientists on the possibility of gathering complementary information from the same samples using both X-rays from the ALS and electrons from HiRES. “This would make HiRES more accessible to a larger scientific community,” he added. The Molecular Foundry and Advanced Light Source are DOE Office of Science User Facilities. HiRES is supported by the U.S. Department of Energy Office of Science.